Impact on Income and Consumption. There are different ways to measure the impact of microcredit on income and consumption. First there is the borrowers’ recall of the “before-after” situation. Using this method in the early 1980s, Hossain concluded that both per capita income and household income were positively associated with the amount of credit obtained from Grameen Bank. The impact can also be gauged through member perception. On the basis of a survey of 1986 measuring borrower perception, Hossain found that 91 percent of Grameen Bank members improved their economic conditions after joining Grameen Bank. More recent research uses income and consumption as dependent variables for the measurement of microcredit programs’ impact. Using this technique, most authors conclude that microcredit institutions can have a positive impact on combating poverty. Khandker takes the lead in this positive evaluation. Together with Chowdbury, he examines the impact of Grameen Bank and BRAC. They find for both institutions that a greater number of loans means a lower incidence of poverty for all program participants. In the Grameen Bank villages, for instance, 76 percent of participants who have taken no loans or only one loan are below the poverty line, compared with only 57 percent of those who have taken five or more loans. Based on his 1998 research, Khandker comes to the same conclusions. He estimates that for every 100 taka lent to a female member of BRAC, household consumption increases by 18 taka. For men, this figure is 11 taka. These results indicate that poverty decreases as the borrowed amount (possibly in different instalments) increases. The study further shows that the poverty rate of BRAC members falls by around 15 percent for the moderate poor and by 25 percent for the ultrapoor when borrowers have a loan for up to three years. Khandker points out, however, that this rate of poverty reduction appears to decline with duration of membership. For instance, for households that have been members for more than five years, moderate poverty fell by 9 percent and ultrapoverty by 18 percent. These figures are considerably lower than for households that had been members for three years or fewer. Moreover, since the “less than three years” category has a lower average cumulative loan size (3,348 taka) compared with the “five years plus” category (6,567 taka), these results suggest that the poverty reduction impact of credit declines with cumulative loan size for BRAC. Khandker and Chowdbury observe the same outcome for Grameen Bank. Thus, the reduction of the level of poverty is variable and declines with the passage of time. Khandker goes further in this comparative analysis. His 1998 study reveals that for both Grameen Bank and BRAC, the per capita spending and net worth (assets plus savings/loans outstanding) of the members has increased. Women, however, seem to score better than their male counterparts when it comes to per capita spending, while men generally have a higher net worth. 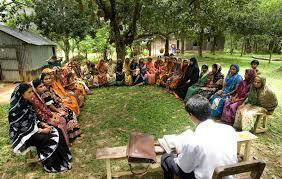 Female members of Grameen Bank show better results on this criterion than those of BRAC. It should be noted that many households working in the agricultural sector have to deal with seasonality in consumption. At harvest time, their income reaches a peak. In other periods they have almost nothing. The programs of Grameen Bank and BRAC help to smooth their consumption pattern. Finally, for a program to be successful, it is not only important to alleviate the poverty of its clients but also to achieve a long-term sustainability of the benefits.